Racers’ comfortable victory, through doubles from Martin Cingel, Ross Borwick and Michael Ireland, plus markers from Callum Boyd and Lewis Young, saw them finish their 16-game league season undefeated, winning 14 matches and drawing two. 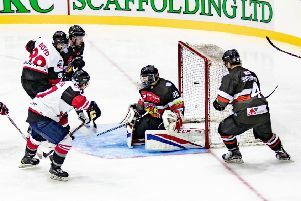 In a busy season, Racers also participated in the UK-wide National Ice Hockey League North Cup, a step up in class the club struggled with at times, however it may be an indication of where their future ambitions lie. 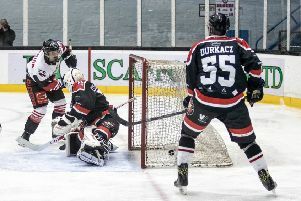 The league may be wrapped up, but in a season that could well stretch on into May with two cup finals and the play-off’s still to fight for, amid the celebrations, Racers director of hockey Tony Hand warned of tougher challenges ahead. “With all due respect to Kilmarnock, they were the weakest team in the league this year, and we weren’t at our best tonight, we certainly took our foot off the gas, that wasn’t our normal team out there. “Tonight’s performance may not have been great, but the boys have been working hard and, over the course of the year, they’ve been fantastic and I’ve told them that. It certainly was a strange game at Murrayfield last night, devoid of atmosphere despite the large crowd, almost as if fans and players alike were waiting for the final whistle, but all that changed once the trophy presentation began, for which the Kilmarnock players sportingly stayed on the ice. With the party already in full-swing in the Racers dressing room, a jubilant Boyd, said: “It’s been an awesome first season. It wasn’t an easy ride, we’ve had plenty tough battles, but to go undefeated throughout the whole league season, you can’t ask for better than that, or have a better bunch of guys to play alongside. “Everything just clicked, it’s class to play in a team where everyone is working hard and enjoying themselves.